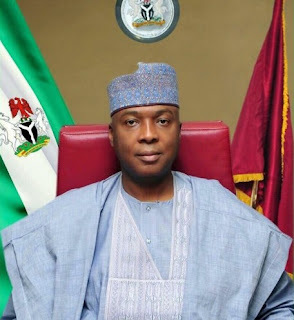 The president of the Senate, Bukola Saraki, on Thursday said he remained committed to the ideals and agenda of the All Progressives Congress. Mr. Saraki’s assurances was in reaction to media reports that he had abandoned his party for the opposition Peoples Democratic Party, PDP. The speculation followed Mr. Saraki’s appearance at the PDP Senate’s caucus meeting on Wednesday. In a statement signed by his Special Assistant on Social Media, Bamikole Omishore, Mr. Saraki said he was not prepared to leave a party he that he “helped midwife and worked for its victory in the 2015 elections”. Mr. Omishore said Mr. Saraki attended the PDP event in “his official capacity as Senate President and chairman, National Assembly”. “He attended the end of session event of the PDP caucus yesterday evening and spent only 30 minutes before leaving the members to continue with the event. “The Senate President would like to assure every Nigerian that he is committed to the APC-led government and appreciates the confidence reposed in him and the APC during the 2015 General Elections,” Mr. Omishore said.